Thank you SO much for the effort of putting this together! I have been struggling for ideas on meal planning. Thank you! I’ve been a skinnytaste follower for years and love all of your recipes! This is my first time trying your meal plans. I did misread the part about all the dinners and weekend recipes feeding a family of four. I’m only feeding myself and my fiancée so I bought way too much stuff lol. Stuff that I can freeze I have to save for later. Overall love it so far! I’ve always seen the meal plans but for some reason never looked into it. When you recently posted people’s success stories that’s when I decided to give the meal prep a try. That might be a good way to market it in the future. Thank you so much for everything! Skinnytaste is the best! Haven’t ever made a recipe from here that I didn’t like! (And I’ve made dozens!) I recommend your site to anyone and everyone talking about food! So excited to try out your meal plans! Thank you! I’m really struggling with meals that are quick and easy and the entire family will enjoy and I’m so excited to have stumbled upon your meal plans! I can’t wait to plan my meals for next week now! I love these meal plans! I’m a single mom, living on my own 50% of the time and these are so helpful! Especially the part with the shopping list! I do modify it because I will have way too many leftovers if I made every single dinner, but this is the best for planning everything else! 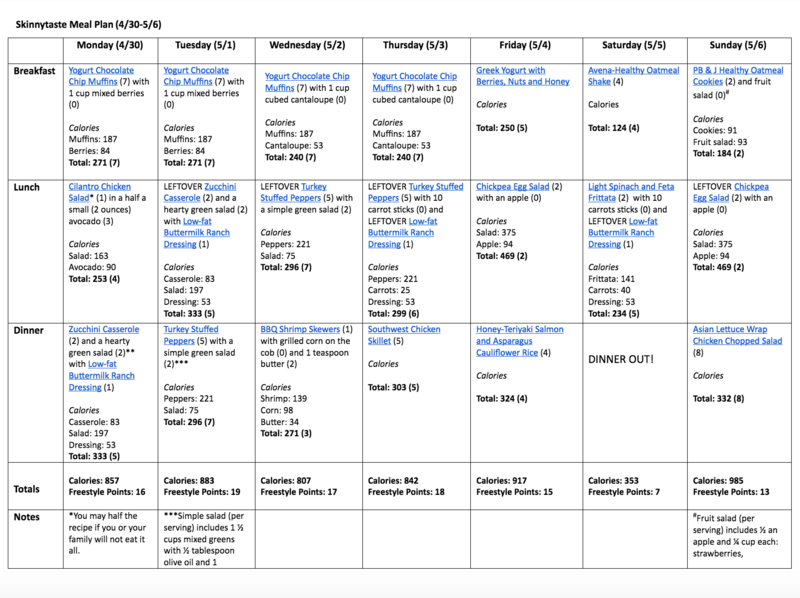 This is the first week I have followed the meal plans and really enjoyed them. Not every meal was a hit with the family, but everything was at least liked by all, and others will be making it into our regular rotation. We had a little too much food so it may take time to figure out how to adjust to our needs, but having everything planned is a huge help and I expect to continue using the plans as a framework with minimal modifications. Having all the food also made it easier to skip eating out. 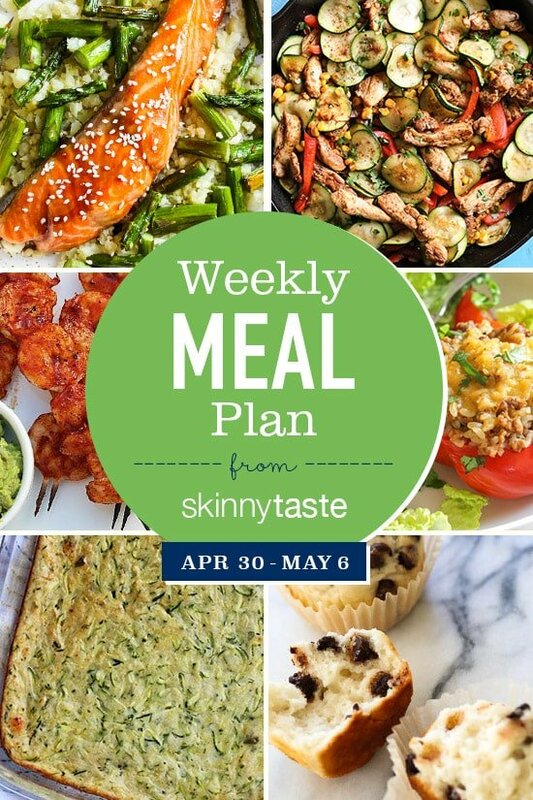 I love these meal plans, they are amazing; and I appreciate all the effort you put forth to put everything together each week, please keep these recipes & meal plans coming :-). I cannot do my grocery list without looking at your meal plan, every week. I have more variety in my meal plan, Thank you so much! Thank you for putting these together! I absolutely love it and it really makes getting through the week keeping the family on track extra simple. Thanks so much Gina for all your hard work in putting these plans together! I am seriously grateful beyond measure!!!!! They are my go to every week to cook for my Hubby and I! Is there a way to print the grocery list without copying and pasting? Am I missing it? Thank you for sharing the meal plans! Just “found” them and – WOW!! Went down the list and everything looks wonderful. I am new to WW and was feeling a bit overwhelmed until I found your site! Your recipes are amazing! Just made the Beef Ragu over Spaghetti Squash this weekend and it was awesome – even hubby approved! Thank you so much for making this journey so much easier! Giving your meal plan a whirl – I’ve bobbed in and out over the years nabbing a recipe (or ten!) but never followed the full meal plan. Made shopping last weekend a doddle and yesterday’s food was gorgeous! Thank you for putting all this together! Just a quick question – is the link to the stuffed peppers meant to go to the Santa Fe ones? It’s just that the shopping list doesn’t include black beans or serrano peppers (and the plain turkey stuffed pepper recipe seems to fit better with what I’ve bought). Cheers! I look forward to your weekly menus! I dread meal planning and this helps so much! Thank you!! I struggle to come up with enough low point options on my own to fill the day – this makes it so easy! This is my inspiration! How would I adjust these recipes ingredients for just 1 person? Love these menu plans. I refer to them often for ideas and inspiration! I’m so excited to try this week’s recipe’s – you make eating healthy so much easier by tackling the hard part – meal planning! Cooking is the easy and pleasurable part! Thank you! I have been following your posts for a while now, but really started following the meal plans recently. At first I as shy because of some of the items being repeated but after really following, I found it was amazing and didn’t feel repetitive at all . I was grateful not to have to cook a full meal each day. I have passed on your site to all of my children and several coworkers. I really appreciate that you can make this to fit any lifestyle menu. Great job! ps I haven’t come across a recipe that I haven’t loved yet! Thank you for these. My husband and I have just started WW and this is a big help. We appreciate the flexibility in your recipes and meal plans since I have a lot of food restrictions. Been using your recipes for awhile now and doing my own menu planning. I have decided to use your menu for the week with a few changes. Thank you for all you do Gina! I’m excited to start using your weekly menu plans! Your recipes are amazing and I love your weekly planner -complete with grocery list. I no longer dread deciding what to cook and what ingredients to buy. You’ve done this for me! Thank you so much!! Thank you! Would also love any of the servings or measurements in weight also. Love using a food scale! Thank you! 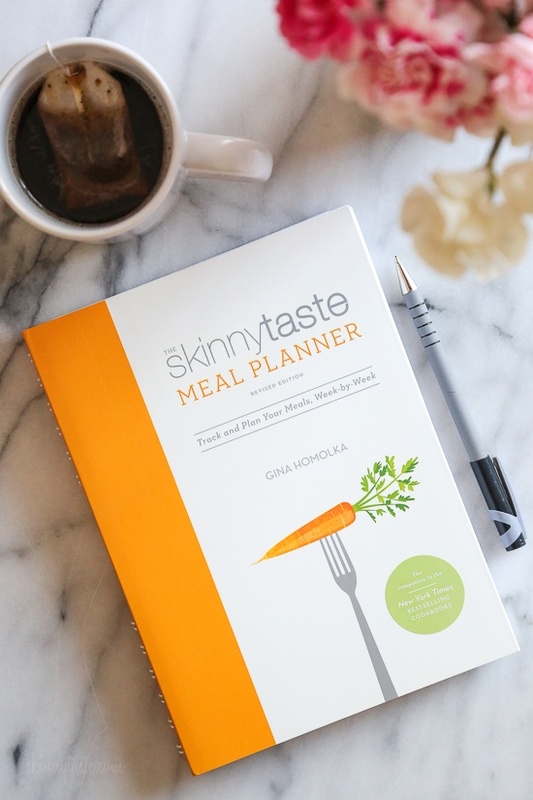 Meal planning is my nemesis, but this will make life so much easier! Question: best replacement for the shrimp? I seriously dislike shrimp. I just discovered this site and love it! The worst part of cooking and eating healthy is trying to figure out what to make. You have solved this problem for me! Thank you so much!!! My wife and I have really enjoyed following your meal plans and its making a difference for use. Do you have a recommendation for lettuce if we’re just not comfortable with romaine lettuce yet? Leaf lettuce just isn’t the same. Your recipes are fantastic!! Thank you for providing such tasty, healthy, recipes for me and my family 🙂 I would like to say though 1500 calories is 300 calories lower than my BMR. So that would not be sustainable for me. (Or quite a few women)I’ve lost about 55 lbs so far eating 2200 calories a day. A better recommendation might be to figure out your TDEE and then subtract 15-20% from that for weight loss. After all the goal is fat loss… not muscle, bone, water AND fat loss. Thank you for doing this! It makes my meal planning so much easier! Your recipes are amazing.